Money changers should not hoard foreign currencies as this could pose risks in a volatile market, the Malaysian Association of Money Services Businesses (MAMSB) warned as the ringgit hits its lowest in 16 years. MAMSB president Ramasamy Veeran said it was never a practice to stockpile and withhold foreign currencies in order to make a profit from the weak ringgit. “It is not a standard practice or a norm… Further, there are risks associated in stockpiling foreign currencies in a volatile local and global market,” he told The Malaysian Insider recently. Ramasamy’s comments come as the ringgit slid to a 16-year low on July 6, falling to 3.8092 to the US dollar. It was last at this level from 1998 to 2005 during which it was pegged to the US dollar at 3.8 following the Asian financial crisis which was blamed on currency speculators. This time, the ringgit’s slide comes amid low crude oil prices, as well as damning allegations against Prime Minister Datuk Seri Najib Razak and his brainchild, state investment firm 1Malaysia Development Berhad (1MDB). Najib is alleged to have received billions of ringgit from entities linked to 1MDB in his personal bank accounts. Ramasamy said MAMSB has yet to receive any complaints about money changers withholding foreign currencies but warned such actions could impact on various sectors of the economy. Under its governing rules, MAMSB can act against money changers found to be hoarding foreign currencies in order to make profits due to the ringgit’s slump, Ramasamy said. “Our members have been advised to ensure that all customers are handled in fair and transparent manner. 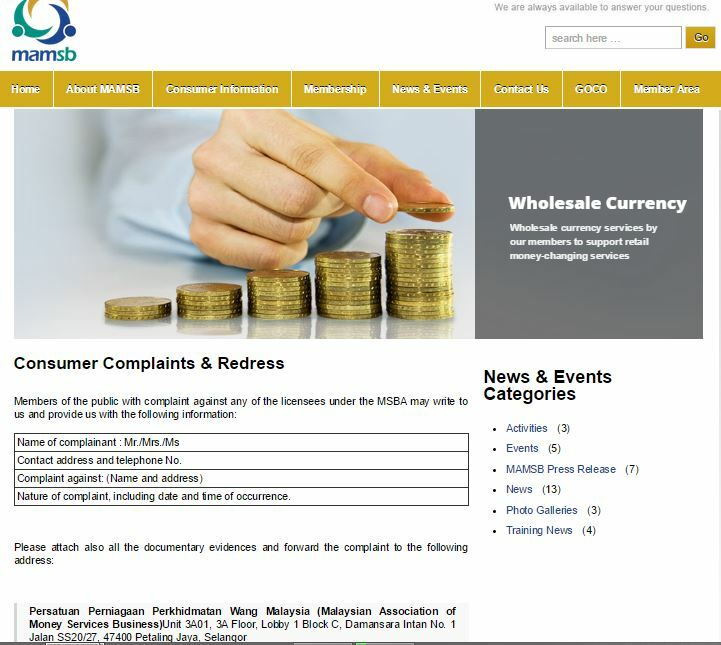 “If any complaints are received on this matter, necessary action will be taken in accordance to our governing rules,” he said, adding that the public could lodge complaints at the association’s website (www.mamsb.org.my) or with Bank Negara Malaysia. The ringgit is Asia’s worst-performing this year and has not been helped by ongoing allegations against Najib, 1MDB, resulting in political uncertainty. 1MDB’s debts of RM42 billion, incurred in six years of operations, have also raised concerns over Malaysia’s credit rating, although the central bank has said that the state investor’s problems alone did not pose a systemic risk to the country’s economy. Fitch Ratings recently revised its outlook for Malaysia to stable from negative previously. Controversies surrounding 1MDB are not yet over, as the fund is currently being investigated by a special government task force for alleged financial wrongdoing, and its books are being inspected by the national auditors for review by a parliamentary bi-partisan committee on public accounts. – July 22, 2015.